Flippers.be - Pinball machine rubber rings for sale. Buy new rubbers for your pinball machine. A clean pinball machine needs new rubber rings. They will improve gameplay a lot and even make the machine look a lot nicer than dirty, worn out rings. I have most types of pinball rubber rings in stock for my own use. These are also for sale. If you have a manual, then please check if it has the rubber ring list. It should be somewhere in there. I need to know how many of each type (in inch) you want. It usually is on the pages that have a drawing of the playfield and show positions of switches and solenoids. 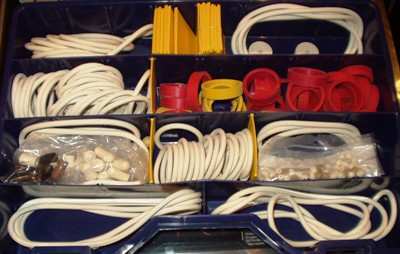 If you don't have a specific list of rubbers you need for your machine, let me know what game they are for and I'll try to search for the correct rubber list. You can also remove each rubber and measure the inside diameter (in inch). Print this pinball rubber chart: A4 paper - US Letter paper. It's easy to use, see what circle matches with the inside of a rubber ring. Important: in the print options screen of Acrobat Reader, set 'Page Scaling' to 'None' ! I don't have a full price list online but I charge the same price as pinball shops in The Netherlands. Just email me what rubbers you need and I'll reply with a total price. 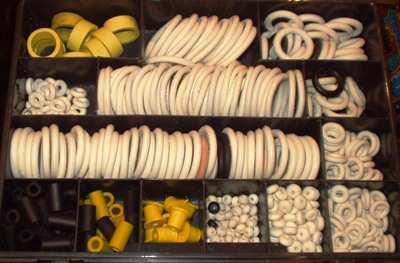 About every type of rubber is available. 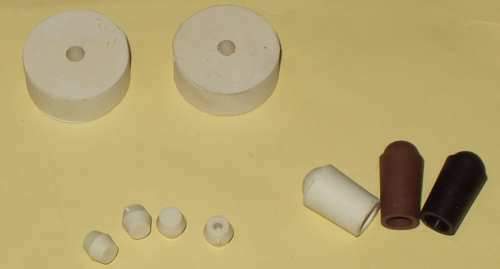 Rings in every size, up to 6 inch (a lot of online dealers stop at 3 inch), including rubbers used on bingos and older pinball machines like 1-3/4 and 2-3/4 inch, ..
Shooter tips, flipper rubbers, sleeves and tapered bumpers. Also 'special' rubbers like the thick rebound rubber used on bingo machines and old pinball machines, or the white rubber caps used on old Stern machines to keep plastics in place. Note I only have white rubber rings for sale. I also have most types of lightbulbs used on pinball machines. Regular lightbulbs (#44 and #555), flashers (#89 and #906), .. and even special lightbulbs (12 volts, or the small lightbulb for the Twilight Zone clock or Creature from the Black Lagoon ramp).